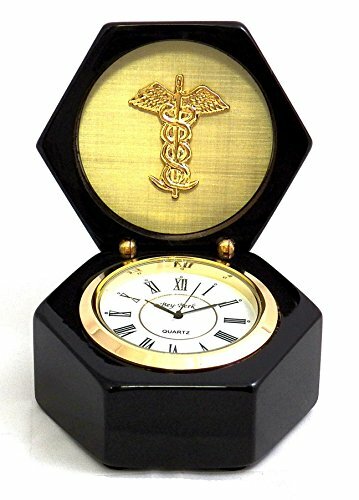 This distinctive desktop clock makes a handsome addition to your medical office. The hexagonal shape lacquered wood box features a lustrous piano finish. Lift the lid to reveal the Caduceus logo tucked under the lid and a handsome clock accented by a lustrous brass plated bezel. Comes complete with a brass plated faceplate for personalization that you can have engraved at your local jewelers. The brass plated faceplate is a separate item which attaches with an adhesive backed tape and can be applied to the top of the box or one of the sides - or does not have to be used at all. Measures: 3.25'W x 3.25"D x 4"H. Quartz movement. Takes one SR626 battery. The hexagonal shape lacquered wood box features a lustrous piano finish.